Got overnight guests, family or friends who need an extra-special way to start their day? Prep this rich and decadent French toast the night before and you'll have a deluxe breakfast the next morning. With this easy baked method, you won't be stuck flipping toast at the griddle either — giving you more time to chat at the breakfast table. Slice the bread: The night before you want to serve the French toast, slice the loaf of bread into 1/2 to 3/4 inch-thick slices. Make the batter: Whisk the eggs, cream, sugar, vanilla, cinnamon and nutmeg together in a large mixing bowl until the sugar dissolves. Dip and stack the bread: Dip each slice of bread into the egg-and-cream mixture and lay flat in a 9x13 casserole pan. You'll need to stack the bread slices in 2 or 3 layers to fit them all in the pan. Store and soak: Cover the pan with plastic wrap or foil and refrigerate overnight. 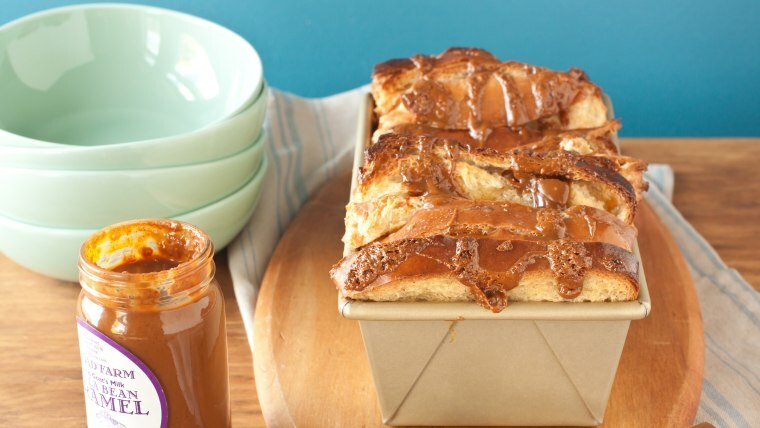 Add optional sauce: For extra decadence, drizzle the bread with caramel sauce, dripping it between the slices. Bake: Bake for 45 minutes to 1 hour, until the loaf is cooked through and crispy on top. Eat up: Serve with additional caramel sauce, powdered sugar, and/or maple syrup.